I try to make my bow hunting experience an all year pursuit. Off trail X-C Skiing is one way I stay connected to the deer-woods during the long winter months here in Northern Minnesota and get out into the wilderness settings that I love. I was hooked on Skinny Skis from the very first pair of wooden Normark’s I discovered under the Christmas tree as a young teen. 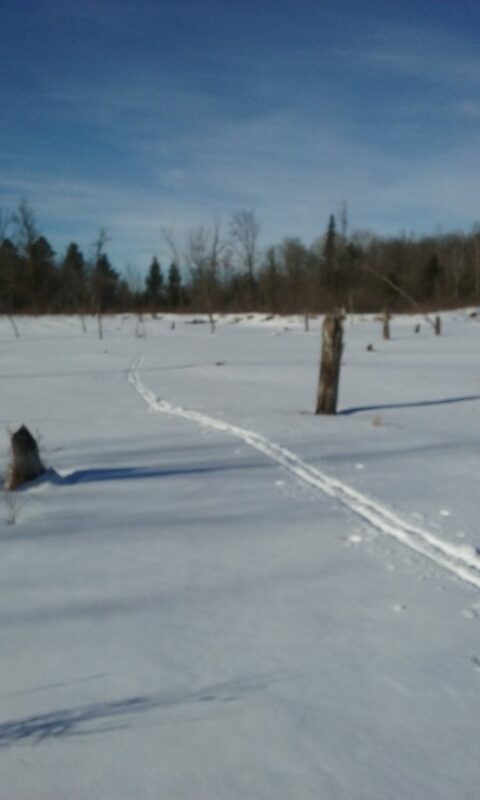 For many years I traversed our local groomed trails with friends but I also acquired a love for off-trail adventure skiing along the Pelican River behind our home on the out-skits of Detroit Lakes MN. There are several reasons I prefer slipping off the beaten path with my ski’s. The solitude is addicting. 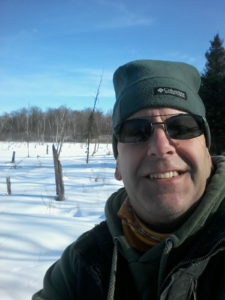 When I am out in remote places during the winter months I feel the same connection to the land as I do when I am bow-hunting. I can almost guarantee you will not run into another soul as you stray from the popular runs. 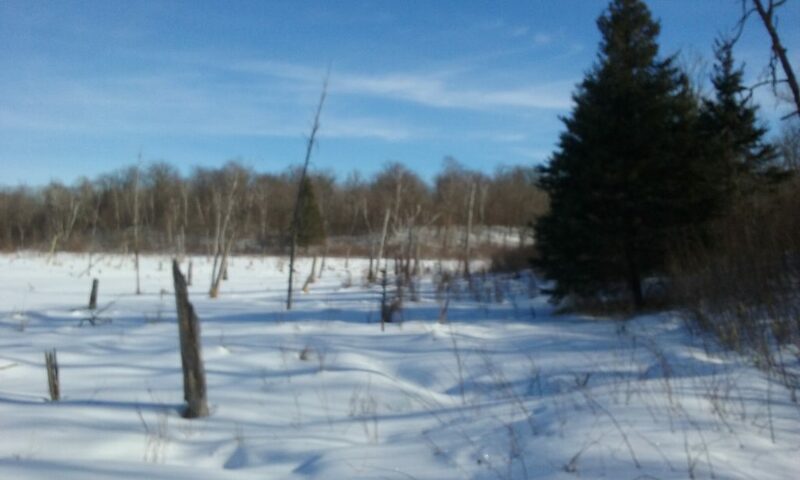 Avoiding traffic also gets me into my hunting areas and I use these opportunities to do some winter scouting. It is not the same type of scouting as in the spring or summer when deer are back in their warm weather haunts, but it allows me to study structure and learn new country. 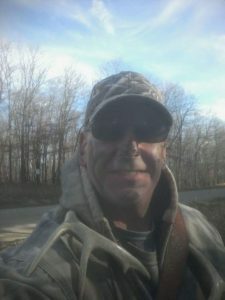 I like to carry a folding brush saw with me and build a quick natural ground blind if I come across the right location. These blinds I will generally set up next to a dead-fall and it gives me multiple options when bow season opens. Lastly, off trail skiing is great exercise that uses similar muscle groups as my still-hunting requires. Besides X-C ski’s, you may also consider Hok skis, or Snow-Shoes, as options for your bush-whacking. I prefer the long skis because of their versatility and greater speed on flat areas such as sloughs, lakes, fields, and trails. You may want to consider the wider skis designed for deep snow versus the narrow skis designed for groomed corridors. Each off road style of travel has its pros and cons. Pawn shops, second-hand sporting goods outlets, or e-bay, are good places to find reasonably priced gear if you do not want to invest in new equipment. Hitting up some rentals at a ski resort is a great way to experiment and find out what works best for you. There is something exhilarating about breaking your own trail for an afternoon of adventure. I may not be able to go on very many wilderness hunts in the remote reaches of the Yukon during my life, but I can fill Saturday afternoons with my own mini excursions on the big public lands just minutes from my home. 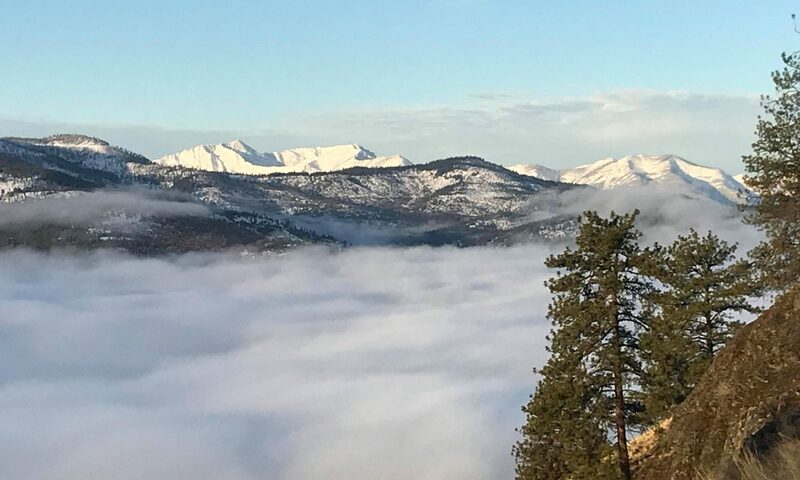 Off-trail skiing is one way I find moments of solitude during the winter months, stay connected to my bow-hunting, and get in some scouting while keeping my hunting legs active. It is a different pace. It is a hunter’s pace. Our Montana connection. Thanks for your contributions Joas! It was the second day of the 2017 Round Lake Bow Camp. I was enjoying a cup of coffee and getting my gear ready for the days hunt when I heard Bill enthusiastically say, “Todays the day”. I smiled, agreed, and stepped out of the cozy cabin to be greeted by the frosty morning air. Fresh snow had dropped the temp’s over-night and it was a perfect day to be in the woods with the Deer Rut in full swing. Promise hung in the air like a snow laden pine bough. The trusty Jeep jumped to a start and Bill backed out of the garage. I took a quick glance over the quiet lake and loaded up my bow and day pack. Before long, icy swirls of air reached around the wind-shield and into the open cab, reminding me it was late October. About a mile drive down the gravel cabin road Bill rolled to a stop at my drop-off, I picked up my gear, wished my hunting partner well, and listened to the five-speed work through the gears as the head-lights disappeared down the trail. As I step into the deer woods the first few minutes are a spiritual pause for me. I take time to give thanks, worship, pray for my family, friends, and ask the Father’s blessing on the day. It is humbling as well, knowing that my ultimate-goal is to take the life of a magnificent Whitetail. My eyes adjust to the blackness and I head up a path we call Ruby’s Road. A stand of Norway Pines I often hunt loomed up on my left, tall shadows against the first glimmer of light. I recall yesterday’s still-hunt after my young buck encounter. I was slipping between these ancient guardians when I spotted a Doe moving through the trees to my left. I stopped, she paused to look my way for a moment and continued. Shielded behind the old-growth I pulled up to full draw in anticipation of the Doe breaking out to my right. I caught a glimpse of her gliding through the brush but she had angled well out of range. I released tension on my bow and stood for some time. My heart returned to its normal cadence. Another amazing close encounter. I decided to walk past the silent towers and strike for the log I watched the Fork-Horn buck from the day before. I followed my tracks and was set up with plenty of time to witness the forest come alive with first light. After sitting for an hour, I decided to move to the opposite side of the clearing where another inviting downfall offered a view to the north. This proved to be a mistake. Another hour passed and my heart quickened when I heard the unmistakable sound of deer meandering through the woods. I strained my senses. Waited for an appearance. But to my disappointment the deer circled behind. Their presence faded West into Ruby’s slough. I scolded myself knowing that I would have seen the deer if I had not relocated. After pouting for awhile I checked my phone. 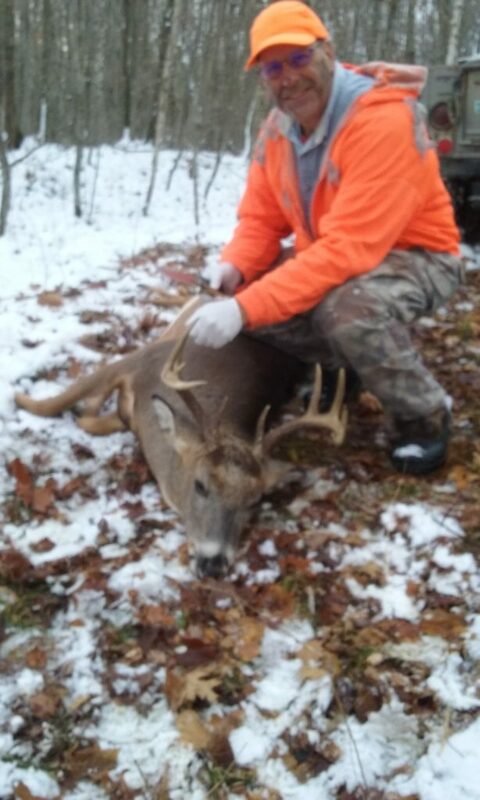 Bill had a buck down! I collected my gear and struck out for the customary rendezvous and lend a helping hand. Another text came with a picture. Holy Crap!!! It was a big ole Swamp Buck!!! Bill’s prophetic words from the morning deer-camp had been fulfilled, “Today’s the day”. I was so happy for my hunting buddy. 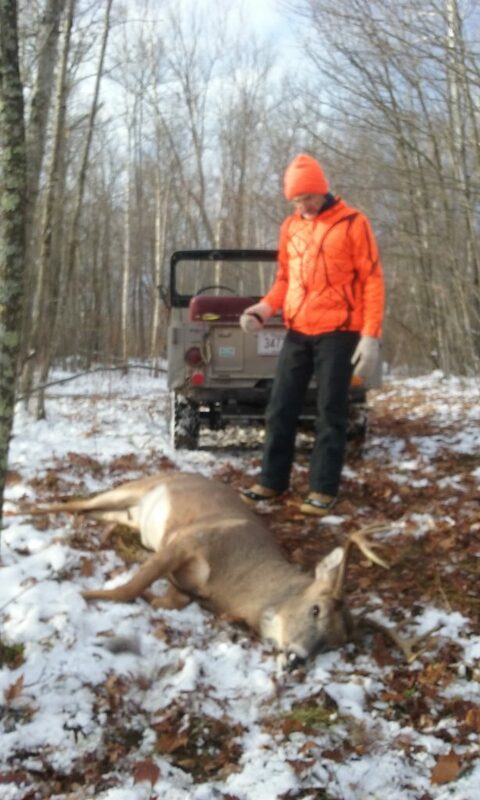 It was his first deer after a many year sabbatical from bow-hunting. When I came out to the road Bill was all smiles, waiting in the Willy’s to spare me the mile walk to his downed deer. Bill had made it to his stand in time for the sunrise as well. The Doe and yearling he had watched all season had not shown. It was a quiet start at the Hundred Acre Slough. About the same time deer snuck in behind me, Bill noticed movement over his left shoulder. He cautiously turned to see a massive ten-point working a scrape line. The buck was fifty yards out but on the move towards his tree stand. At twenty-five yards the old warrior stopped and stretched up to sniff a scent wick hanging from a branch. This was the time. Bill knew he had to draw or the animal would soon be hidden in thicker cover and out of range. 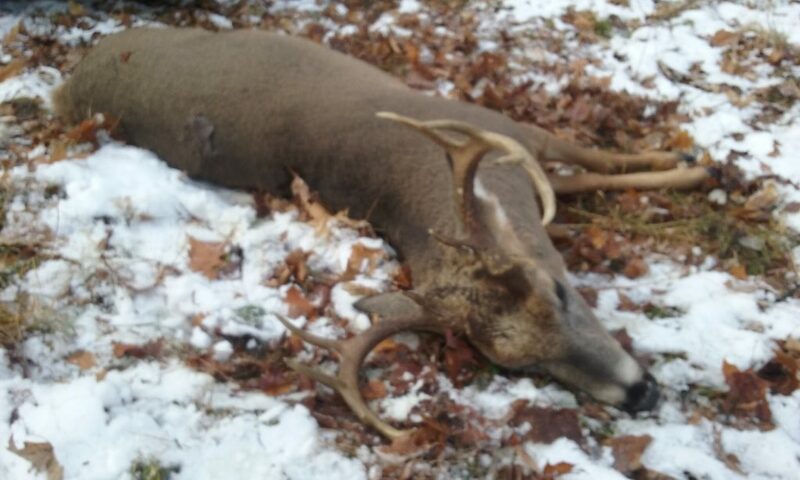 The old buck was quartered away hard, but there was a shot available. Instinct took over. The arrow was sent. Found its mark. The broad-head sliced through the liver, lungs, and heart. After running thirty yards the elegant creature fell on the logging trail. It was a beautiful animal that had seen many winters. We had navigated the pot-holes and deep puddles of the logging trail back to the kill site. Bill backed the Willy’s right up to the buck and commented with a grin that he planned it that way, after the nine-point I shot last year he and his brother helped retrieve over land and water a mile back in swamp country. (After that amazing, near-death experience, I vowed to quarter any deep-woods buck I kill and pack-em out on my back). Bill had a way with words and some-how I found myself field-dressing the animal after his long absence from deer hunting, and a wry claim he was a little out of practice. But I didn’t mind. I was so excited and having such a blast I jumped right into the task after we re-lived the thrill of ‘Bloody Bill’s’ fine shooting. After the dirty-work was done we lugged the trophy into the back of the Willy’s and made the slow ride over the Swamp Road back to deer camp. It had been a good morning. Bow hunting with friends is a rare opportunity. Words fail to capture the emotion, satisfaction and deep abiding joy of the adventure. It is a privilege we all hold dear to our hearts. Lets be thankful for the rich public wilderness lands we have, cherish the hunting moments, and thank God for the friends we share them with. It is a treasure few experience. Should there be a, versus, in this title? I have noticed a slight amount of friction between traditional and compound archers. Most guys & gals following this amazing sport are really cool, but there is always a troll, or someone out to prove a point through putting another bow style down. This should not be. With the anti-hunting movement growing against our ancient heratige, we should stand unified in the hunting community and the ethical pursuit of game. Here is my thought on this rift in the archery world. I love bow hunting because it allows me to experience my passion for the Whitetail chase in a completely new and personal way. As I keep the art of hunting my priority, it allows me to bypass the arguments of traditional versus compound styles of shooting, and focus on my woodland craft of getting close to a big game animal. With this mindset I can enjoy my own limitations, successes, and failures along with those of my fellow archers, regardless of my weapon of choice. Lets stand together and remove the, versus, from the archery world. We all have the same goal in mind. 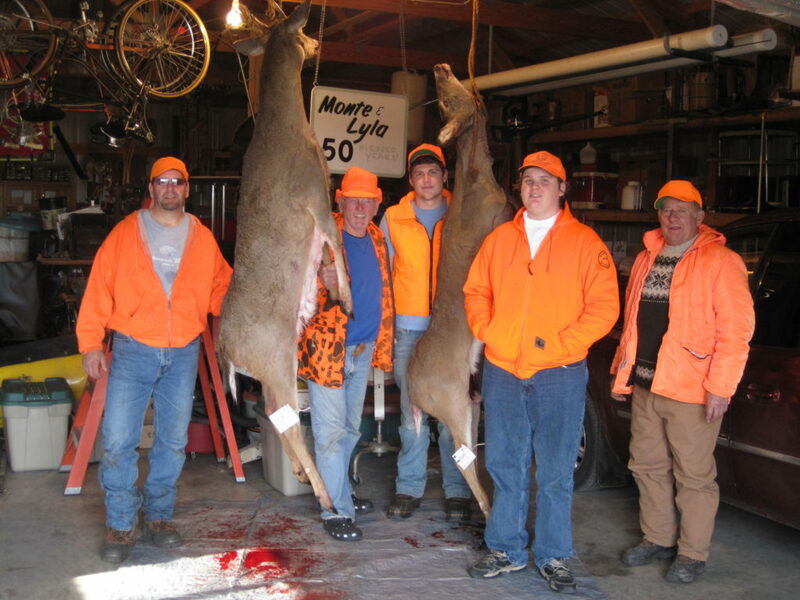 To enjoy the exciting world of target shooting or bow hunting with our family and friends. God bless you in your hunting passion. 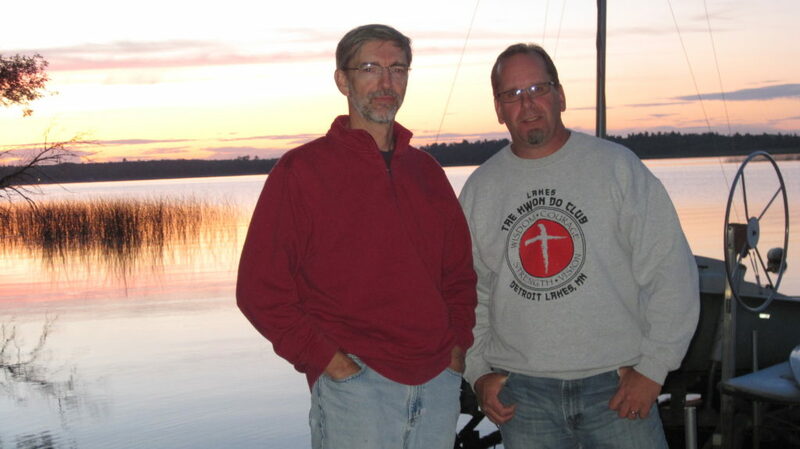 My friend Bill and I go way back to our child-hood days when my family had a cottage several doors down from his on Round Lake in Northern Minnesota. Years later we still gather at his cabin for our annual ‘Round Lake Bow-Camp’. We share many memories growing up together and it is a blessing to still have camp-fires on the same beach, fish on the same waters, and bow hunt in the same woods we grew up enjoying. The forest floor was covered in the seasons first snowfall. I stepped over fresh running tracks as I followed Ruby’s Road out to my morning sit in muted light of the pre-dawn timber. Bill had dropped me off at the trail-head in his old, open-top Willy’s Jeep, before he headed up the Swamp Road to the Hundred Acre Slough and his favorite stand. The snow was soft and quiet. I felt like a shadow. It was the last weekend of October and the first day of the 2017 Round Lake Bow Camp. The opening hours proved uneventful despite abundant deer sign. I was set up in a natural ground blind just beyond a stand of Norway Pines near Sucker Creek. After sitting for several hours I poured myself a steaming cup of coffee. I followed my normal routine and readied myself for a still hunt. Back on the trail I moved slow, paused often, watched, listened. I was headed toward The Christmas Trail which Bill and his brother Mike named to honor a perfect young Conifer they had discovered while blazing the new path. The young sapling has since grown into a teenager… if you count in tree years. I stopped behind cover on the edge of Ruby’s Slough and spied a Doe and Yearling along the far tree-line. Their dark silhouette popped against the snow. If I had my Remington semi-auto the Doe would have made a nice two-hundred-yard shot. I waited till the pair moved well out of sight before moving. 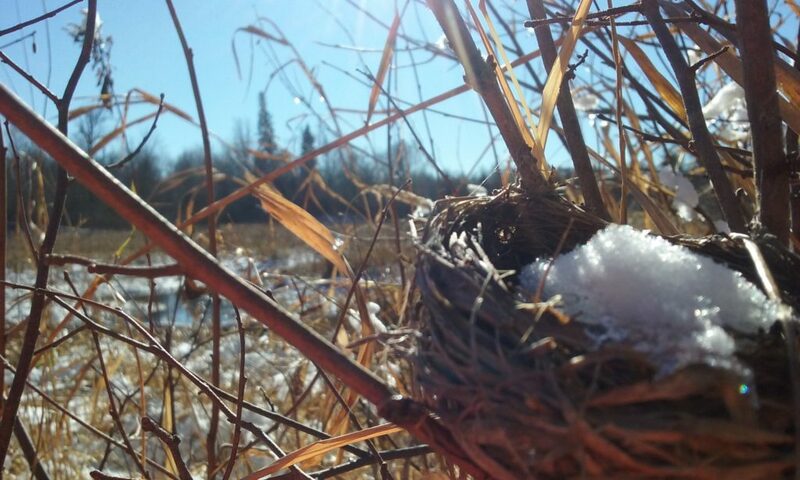 I took in the beauty of the moment and soaked in the late morning Sun before traversing an old Beaver Dam which connected to the opposite bank. After crossing the dam I settled up against a dead-fall and kept a watchful eye. I always love coffee and a sandwich in the woods, it gives me time to plan the next part of my hunt, give thanks to God for the blessings in my life and take in the solitude of bow-hunting. A still small voice suggested I sit on the East side of Ruby’s Slough. I have taken many nice deer over the years listening to the Fathers guidance! I gathered up my gear, made my way to a little knoll between two grassy out-cropping’s and set up on a log with a gentle West wind across my face. A thick wall of brush hedged me in from the back and my forward sight revealed an open draw and hardwoods dotting a large gradual hill to my left. I leaned into my bow which was set up-right on the ground, closed my eyes, became like a tree, and waited. It was a bright quiet day. The forest floor reflected a fluorescent glow. A couple dreamy hours passed when I noticed movement to my right. A deer emerged like a ghost from out of the swamp about sixty yards away. Relaxed in its posture, the animal turned and plodded up the small incline. At first glance I thought it was a Doe, but soon noticed it to be a young buck. Now the visitor was ten yards directly in front of me. Broadside. My heart pounded. In that moment I rehearsed my options. It was a fine offering for the freezer, but I continued to watch. I did not have Buck-Fever but a deep admiration and awe at God’s creation. As the young warrior came to my boot tracks he stopped, flinched, turned his head, and looked directly at me. I felt like he would see me breathe or catch my eyes blink behind my sunglasses, but we simply stared at each other. The Fork-Horn’s whiskers sprouted from a young face that had not turned gray from winters of eluding prey, eyes that searched, his brownish black hair a masterful blend of woodland camo glistened in the Sun and ivory antlers stretched up over attentive ears. Time halted. After several long seconds the forest-dweller dipped his head and grabbed a mouthful of leaves. He glanced my way again and decided I was not a threat. I decided too. I decided to be an observer. Many great quartering shots were available as he continued, but for the next five minutes I had a front row seat to the way of a Whitetail grazing in the forest. The buck meandered, stepped on the Christmas Trail and followed. I watched him angle up and disappear over the hill, leaving only silence, his tracks, and a life-long memory behind. 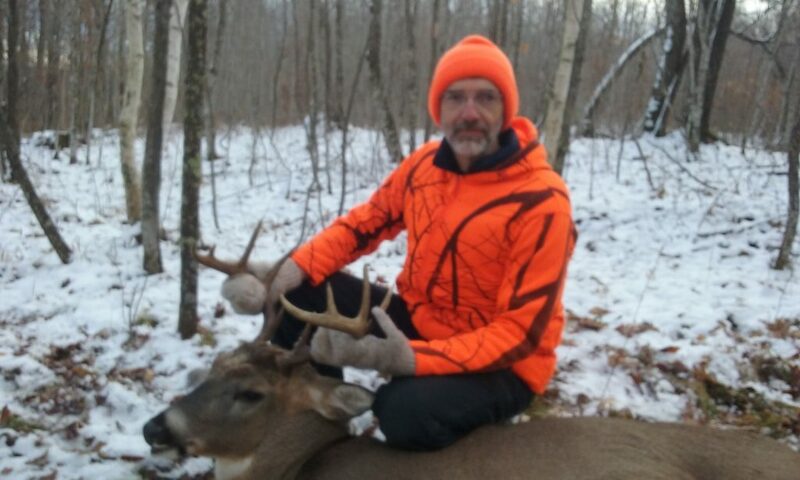 In this post I would like to depart from my bow-hunting experience and reflect on the family hunting heritage I have been blessed with here in Minnesota. 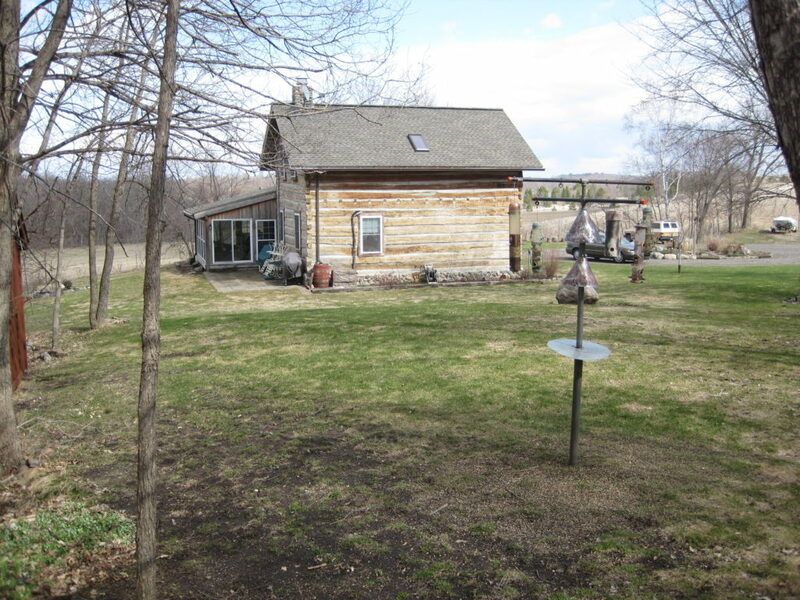 Deer camp has been a tradition across North America for many generations. From the small Shanties of yesteryear where hunters gathered to harvest meat for the winter, to our modern cabins of luxury and taking an animal of choice, the excitement of deer season has remained the same. 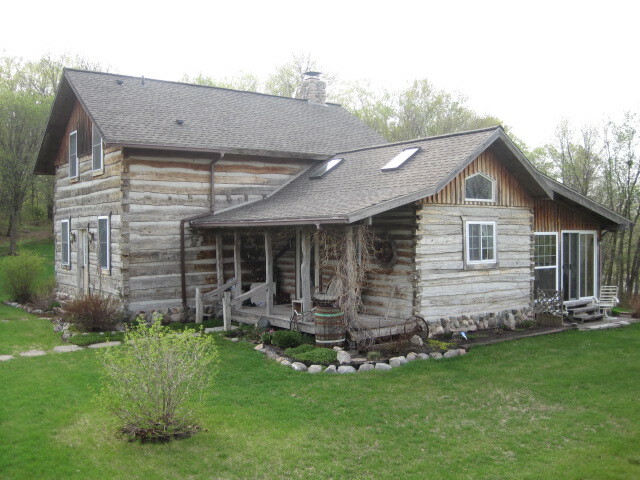 My fondest memories of deer camp bring me back to Grandpa and Grandma’s cabin on Little Spirit Lake in Vergas Minnesota. I wedge my cased Remington 30-06 semi-auto into the back of my pick-up with the other gear and make a quick mental check-list. Cooler with grub, hunting clothes, boots, ammo and buck tag. I am set! I hug and kiss my wife and roll out of the driveway with our Son for another hunting season. Out on the road I witness the annual parade of campers, and 4×4’s with orange gloves and hats stuffed up on the dash-boards driving to their destinations. 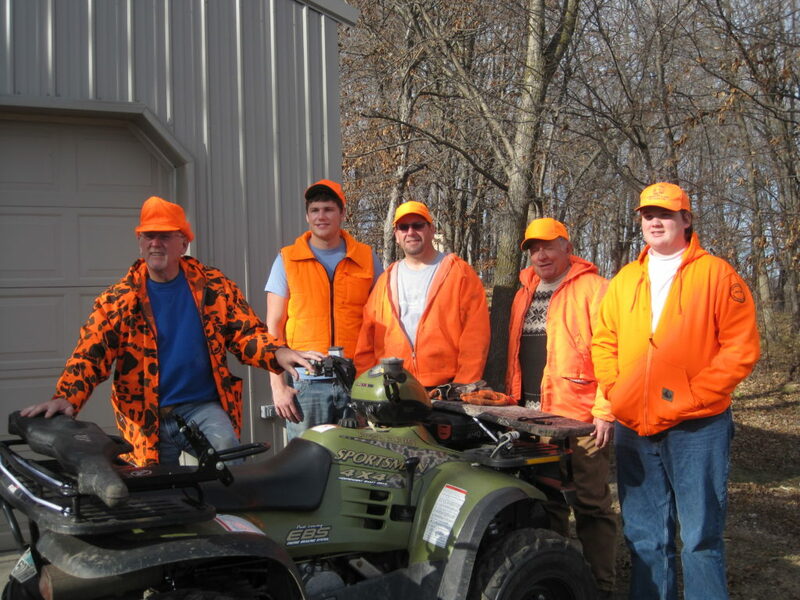 Some are stopped for gas and last-minute supplies while hunters, sporting their favorite blaze hunting caps, share the excitement of the annual pilgrimage with one another. Grandpa’s cabin is forty-five minutes East from my little town, which is situated on the transition zone of Prairie and Lake Country in West Central Minnesota. As I get closer, my pickup seems to anticipate our arrival like a team of horses heading back to the barn after a good run. I turn into the cottage driveway and my headlamps scan the edge of the woods in search of deer activity. The gravel under my truck tires is a welcome sound as I roll to a stop next to Grandpa’s old tan Suburban, his hunting rig of choice. I step out of the heated truck and breathe in the clear cold air. As I grab my rifle and duffel from the pickup box I pause, and gaze up at the brilliant canopy of stars. Orion the Hunter watches over me. A hint of wood-smoke is in the air and my boots crunch the carpet of leaves as I make my way across the lawn. Deer Camp! I lug my pack through the door and am instantly greeted by familiar voices, smiles and hugs. I work my way through the gathering of family and friends to set my rifle with the collection of hunting guns before getting settled in. The fireplace holds a crackling blaze and sandwiches are being made for tomorrows lunch on the stands. The cousin’s laughter, old hunting stories and boastful promises of this years biggest buck fill the room. Supper is announced and we gather around the table for Grandpa’s traditional giving of thanks. After jostling for the front of the line, we all settle in for a feast of Grandma’s homemade Chicken and Dumpling soup, another hunting camp tradition. One by one we start pulling ourselves up from the couch and easy chairs to make last minute preparations for the hunt. Some stay up playing games and visiting, but I turn in, even though I can never find sleep before the quiet hours of the night. I lay wrapped in the comfy cabin quilts. The wind plays at the windows and I hear an occasional pop from the ebbing coals under the fireplace grate as the murmur of voices and laughter drift up through the floor. I turn my thoughts to past deer seasons, old friends, my sweetie back home, and dreams of how tomorrows hunt might play out. Finally my anticipation gives way and allows me to capture a few hours of slumber. The next sound I hear is Grandpa making coffee down in the kitchen. Its daylight in the swamp at Deer camp! I have always enjoyed trying to rattle in Whitetail bucks, but its been with limited success at best. 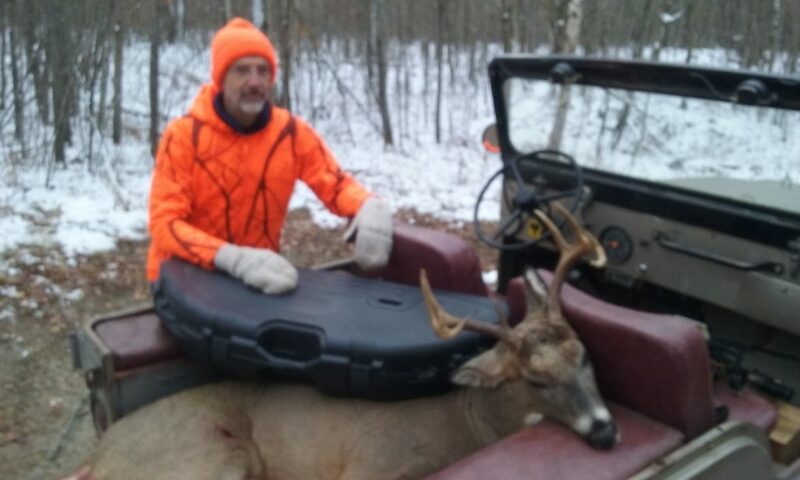 In talking with my friend Bill, we concluded that one reason it seems difficult in the Minnesota north-woods setting, is due to Timber Wolf predation and public land hunting pressure, which places the deer population on higher alert compared to the farm land animals to the south and west of our region, but this could be a hunters excuse. Whether there is any truth to our conclusion, or its just my line for bad rattling technique’s, it’s been a fun learning curve. 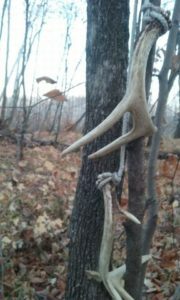 One avid bow hunter I swap stories with gave me a word of advice, “don’t give up on rattling for bucks”. I think I will take those words to heart, and keep on trying to lure in Ole Wooly with my antler clashing. Here’s a rattling story from last season. 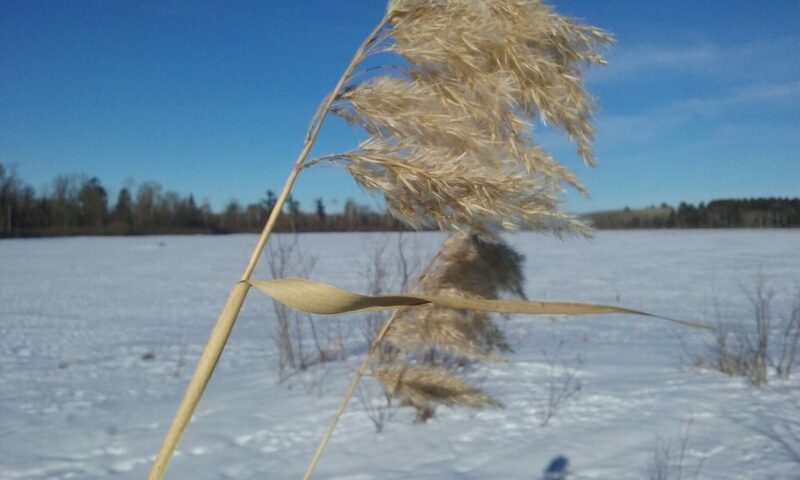 I face a stiff west wind as I head out for an afternoon hunt on the Tamarac Wildlife Refuge. The autumn sky was veiled. It had been a rainy week, the air was damp, but not cold. 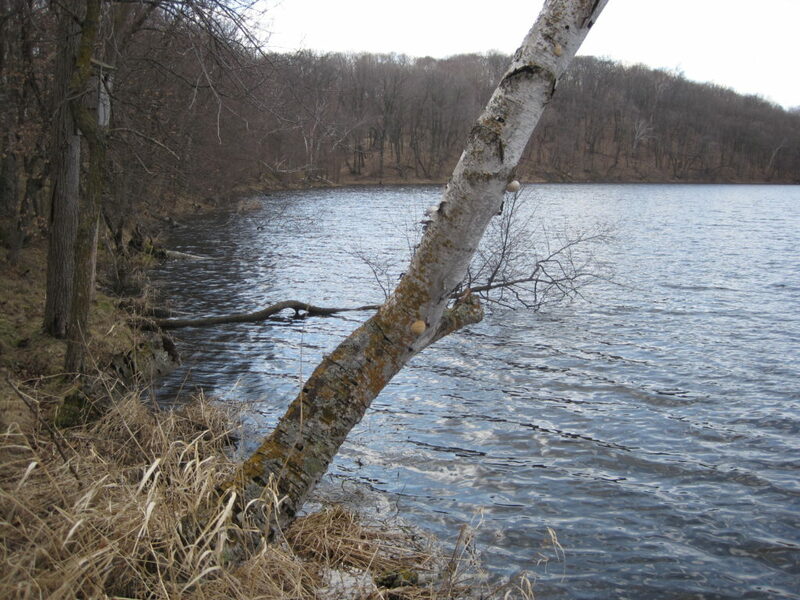 I wanted to get set up on the south edge of about four hundred acres of deer woods that bordered the east side of Tamarac Lake. Flanking this chunk of trees was an equal sized natural meadow, mixed willow cover and sloughs. It was the type of afternoon and terrain that just felt like deer hunting. 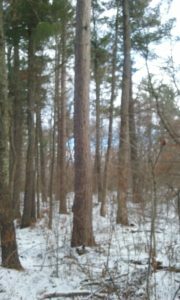 I had hunted the north side of this plot before but always noticed a mature stand of Norway pines guarding the southern tree-line. They drew me like a leaf to the ground. Before long I stood facing the giants as though I was waiting permission to enter under their watchful eye. Not yet willing to commit an entrance into the forest, I still-hunted my way along the edge, peering into the shadows in hopes of spotting a bedded deer as the steady wind covered my movement. I came to a finger of grass which pointed into the woods. Two converging deer trails emerged from the thicker cover and emptied into the meadow. This was the spot for my evening ambush. Several downfalls provided good sitting spots. I decided on one and set up my carry-in stool. 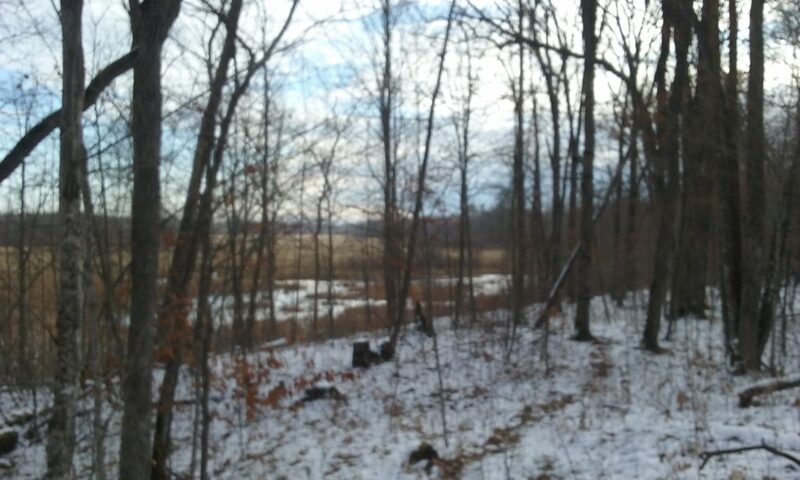 The deadfall offered good back cover and an excellent view of the denser woods and clearing. I was in a transition zone for the forest, and the deer, where the trees relented their hold and conceded to the prairie grass. After settling in, I sat motionless for quite some time before attempting my first rattle. My approach has always been to mimic two smaller bucks sparring, in hopes of attracting a dominant animal to come and stake his claim. 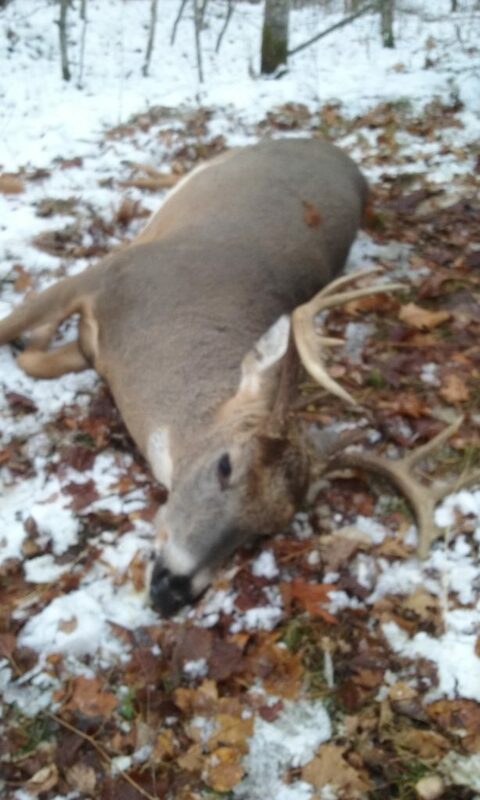 After working my cherished buck horns I had taken many years before, I waited. 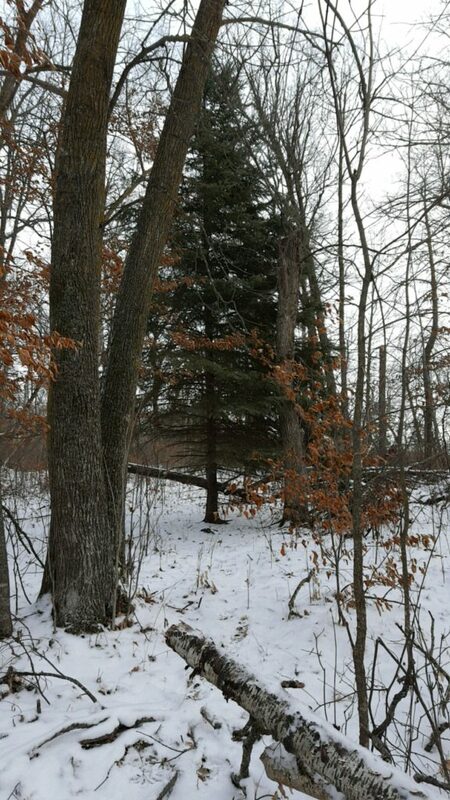 The tree-tops tossed in the wind, but I was bedded down, protected on the forest floor. The woods were expectant, waiting on the woodland creatures that inhabit the night. I sat in expectation as well. There was just under an hour of hunting light left, and fifteen minutes had passed since my last rattle. I tried again. I slowly lifted my antlers, secured at their base by a small rope, and touched the tines. Instantly, a deer signaled its warning and disapproval of my presence. It was about thirty yards into the woods, just out of my sight. The alarmed animal worked its way around me announcing its warning call about every thirty seconds for several long minutes before it moved on. 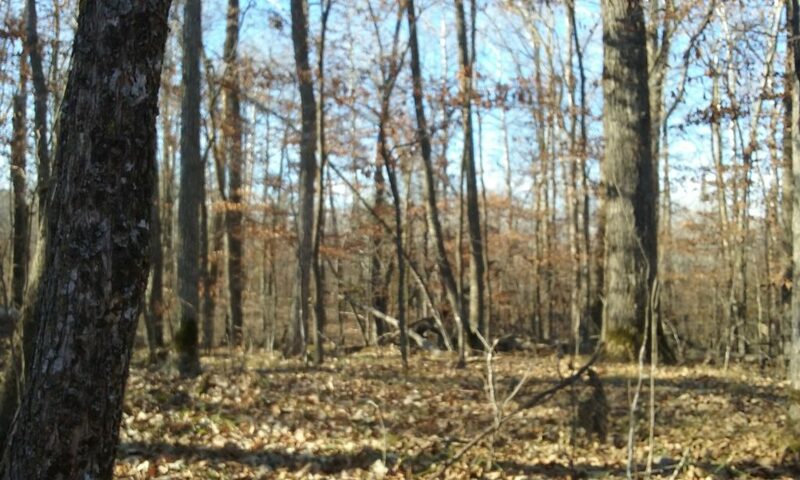 Except for the haunting wind, the Whitetail’s agitation left the forest quiet and alert to my intrusion. I had been completely busted. After the deer was gone, I fought the urge to get up and make my way down the line of Norway Pines to another location. I realized that was pointless, and sat tight, with one last hope that a cruising buck from some distance away may still come through, unaware of the recent drama. That buck never materialized, and once again I witnessed the forest change to night. Was that deer making its way toward me in response to my first antler call? Did it see my movement when I rattled? Was it just bad timing, and happened to be walking toward the field at that time? Was it a trophy buck, or a cautious doe? These are the questions I have to live with. I did learn a great lesson. Even tough I had decent cover for a ground sit, when I added the rattling technique, I needed to have a downed tree or some sort of cover to protect the sequence of movement. Having never attempted using a rattle call on the ground before, it was a good tutoring session. 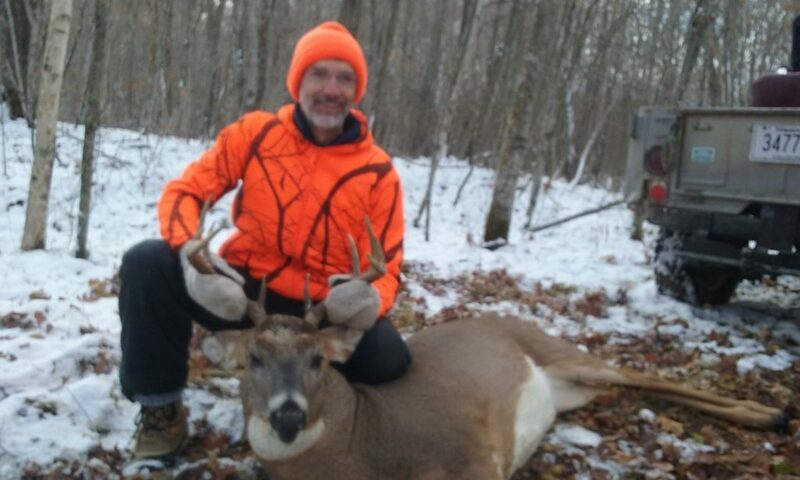 As I look back on this hunt, I have a feeling the animal in this story is the dominant buck I walked up on in the ‘Close Encounter’ post as it was in the same area. I will be back after him next season!! Regardless of this hunts outcome, it was a successful outing for me because I was there, and I can add this story to my other ‘Trophy’ memories I have collected over the years. I hope you can take a few moments and record your own hunting experiences. It is a great way to etch them into your story-telling catalog. I want to address the most important aspect of rattling and hunting from the ground with your bow. Movement. When I was a rookie hunter, one of my mentors, Pastor Fred Soyring (RIP), always preached that if you want to see deer from your stand, movement was critical, or I should say, the lack of movement. This never left me, well, at least I know its value, but to be honest, I don’t always follow through! There are many great videos on YouTube, and articles for learning the finer points of rattling in Whitetail bucks that I encourage you to find. They have been very helpful to me, but this hunting tip has one specific focus, concealing your movement while rattling and hunting on the ground. The obvious approach to concealment is a ground blind. I have not used one myself, as I like to travel light, and be mobile, but I am thinking about buying a light-weight, carry-in model. The other option for ground hunters like myself, is locating good cover. I will discuss a few factors of using the terrain to your advantage. Background foliage such as a downfall, or heavy brush is imperative, regardless of whether you are rattling or not. This breaks up your silhouette. But for rattling, you need to be sitting behind a fallen tree or some thick brush as well. Another option is to find a small ravine, or hole to drop down in to conceal your movement. Another good idea is to get tucked up next to a waterway, or set up on a steep hillside. This keeps deer traffic in front of you, and decreases the odds of getting busted from behind, but you should still try to have cover concealing your forward position for rattling motion. 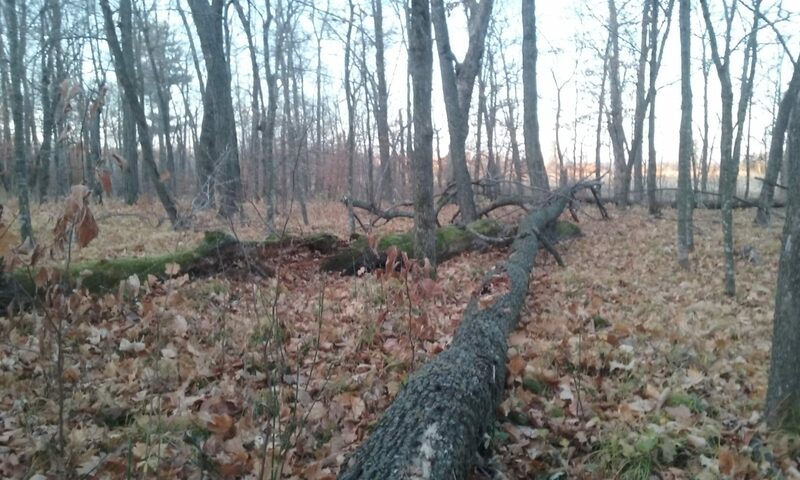 Also, when you are doing your winter and spring scouting, you can locate great ambush spots, and build some natural cover blinds to slip into when the season opens. Its just another great excuse to get in the woods! 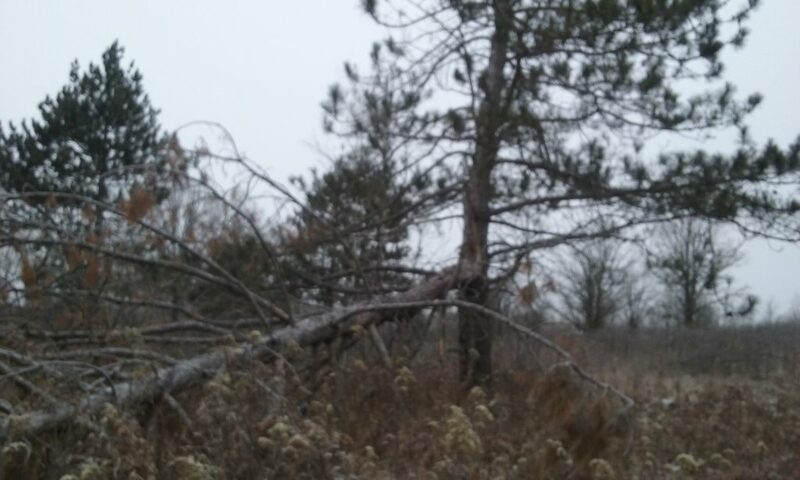 Think of it as scouting good tree stand locations, just on the ground. This will give you some ideas to think about if you choose to become a ground hunter. It really ramps up the challenge of hunting, and those face to face encounters are intense. So for a quick review, remember these key points in trying to rattle in bucks, and hunt from the ground. (1) Back ground brush or trees to break up your silhouette. (2) A downed tree, stump etc. in front of you works to hide your rattling sequence, and hunting movement. (3) Using terrain such as waterways and hillsides for taking advantage of natural deer funnels decreases your chances of being discovered. God bless ya, and have fun hunting from the ground. There’s nothing like it!